 Integrative Health combines the best in conventional medicine, food, movement and mind/body/spirit disciplines. 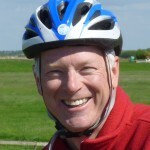 In Part 2 of this two-part series, David Read continues to recount how his family shared eleven days of cycling, nature and nurturing relationships with family and friends. Cumberland and its salamander who lived to see another day were barely in our rearview mirrors, and our adventure continued. The C&O canal and adjacent tow path were built to transport goods inland in the early 1800s before trains had taken over as the preferred transportation option in the mid-19th century. Canal boats and barges were pulled by mules and horses. They ascended and descended via a lock system with water supplied at various points from the adjacent Potomac River. The C&O canal operated from 1831 to 1924 and 74 locks were engineered to keep it operational. Only a few miles onto the towpath, we gave up counting turtles sunning themselves on floating logs in the canal after we passed 100. Other wildlife sightings included many deer, rabbits, and a half-dozen large black snakes slithering across the trail. One of the more comical animal encounters we came across was a small herd of goats with a sign announcing that they were grazing there to perform trail maintenance by eating overgrown vegetation on the sides of the trail. Cumberland to DC was indeed slightly downhill all the way. But even with gravity on our side, our average speed actually decreased with all the mud on the trail which was hard to avoid. 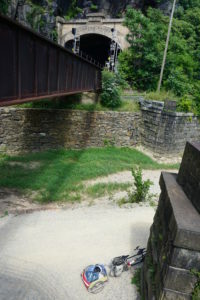 The GAP trail is a rail trail with well-packed stone dust over some wide, well-engineered ballast substrate and much of that trail can even be ridden with road tires. The C&O canal tow path, however, is a bit more “natural” and sections can be a slog for bikes, especially when wet. To make matters worse, two weeks before our trip, this area experienced record-breaking rains. 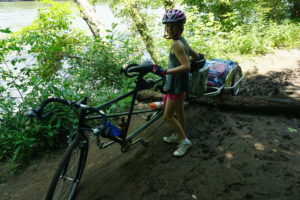 In early June, the Potomac River flooded and spilled over much of the towpath, washing some sections out and making the trail impassable. There were several well-marked on-road detours and at times we had to go over or under fallen trees that had yet to be cleared. We did find the National Park Service website very helpful for detour information and the status of trail repairs underway. Each night we scraped mud out of our brakes and derailleurs, and some places provided a hose outside to wash the bikes off – same for our water-resistant bags which we wiped down with a cloth each night. Even when the weather is dry, the C&O is mostly a double-track route with grass in the middle and along the sides. So, a double-wheel trailer was tough as each wheel straddled the grass most of the time. On this route if a trailer is needed, we’d highly recommend a single wheel trailer which stays in the worn track with much less resistance. Several cyclists with one-wheeled rigs who were passing us had already figured that out. One place we stayed deserves a special shout-out. A section of the C&O trail just west of the Paw Paw Tunnel traverses a fairly remote section with not many accommodation options. After a little research while planning our trip, we came across the Three Otters Eco Retreat across the Potomac in West Virginia. On the day when cyclists are staying there they leave an orange highway cone on the trail. Inside the cone is a whistle that arriving cyclists toot to alert the Three Otters team to paddle across the river in canoes to collect weary bikers on the Maryland side. This was a fun diversion from the trail and it all worked out as planned. They even offered to put our bikes in canoes and bring them across too if we wanted. I needed a break from even looking at the tandem so I buried it in the woods and locked it up along with the rest of the family’s bikes. They were safe and sound when we arrived back the next day. For accommodations, Three Otters has a fun mix of yurts and vintage 1960s travel trailers to spend the night in. At Three Otters some of us swam while others just cooled their feet in the river. We enjoyed using their community kitchen and relaxing in the screened porches overlooking the Potomac. A campfire and s’mores that night in West Virginia topped off a great day. On the C&O we also stayed in the small towns of Hancock and Williamsport, Maryland. On this section of the route, for those who may need a reprieve from the trail’s surface, there is the option of the Western Maryland Rail Trail that runs parallel to the tow path for about 20 miles and is currently in the process of being extended. This was a much needed and welcome break from the mud for us. Like any unconventional opportunity, we had plenty of reasons not to do a bike trip: too much work at the office, another slot had opened up at the kid’s summer camp, offers to join other families at the beach, etc. But all of that we had done before – so we thought, if not now, when? 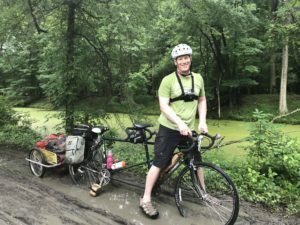 While self-supported bike tours are not for everyone, they sure seem to be a pretty good metaphor for life. There are some good days, some bad days, some wet days and some amazing days. We had the usual flat tires, a few skinned knees, a bee sting and more than one opportunity to get to know your bike up close and personal. Every long bike journey has some mechanical problem and ours of note was a persnickety front chain on the tandem that fell off many times, and at least a dozen times one day. Our repair kit included a chain tool which I had used a few days earlier when the tandem’s rear chain had snapped, but the front chain issue seemed to require more professional help. 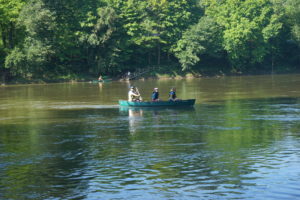 So we limped across the Potomac and waited for Shepherdstown Peddle and Paddle to open. Their skilled mechanic, Kenny, said they always take care of the through-cyclists and could likely get us going. The front hanger of the tandem has an elliptical design with a wedge that is supposed keep the right amount of tension on the front chain. With the right tools, he tightened everything down and the tandem was good to go again. 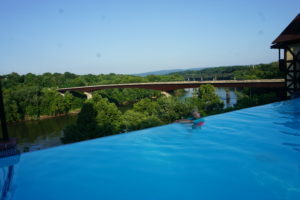 My family and friends didn’t mind waiting out the repair at the nearby Bavarian Inn in their infinity pool overlooking the Potomac. Their food and bar bill, which I picked up, was more than the bike repair. No worries, we were rolling again. This trip was more than just sipping Bloody Marys or Arnold Palmers by the pool after a day’s ride – there were the usual and sometimes daily moments of stress that crop up during any type of adventure like this. During one short rest stop, Steph managed to slip and fall into the Potomac. The river’s current was swift but fortunately she’s a good swimmer. She quickly grabbed a handrail but I can still remember seeing just the top of her bike helmet under water. Next up on the route is the historic town of Harper’s Ferry, West Virginia, where abolitionist John Brown had organized a revolt to end slavery in 1861, an event that some historians say was the defining catalyst for the Civil War. You can lock your bikes below in the racks on the trail and ascend the iron stairs to a pedestrian bridge and not far away there are many food venues among the town’s historic stone architecture. Our last night on the trip would be spent in Leesburg, Virginia. To get there we rolled our bikes onto the car-ferry service at White’s Ferry, Maryland for one last trip over the river – this time not on a bridge or in a canoe. 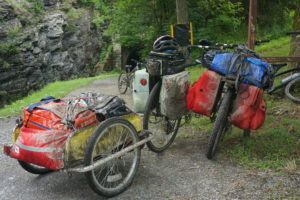 The ferry attendant looked at the long tandem and trailer and said, “I don’t know what to charge you for that thing.” He shrugged his shoulders and asked for $2 – the same as for one-seated bikes – a real bargain for one last ride across the beautiful Potomac. The next day, when we arrived at the Great Falls viewing deck (not to be passed by! ), we knew we were on the home stretch. We weren’t on a remote section of trail any longer as we were with other tourists who came to see the rushing rapids not far from DC. A few hours later and after 335 miles, we rolled into Georgetown in the early afternoon of July 3rd after 11 days on our bikes. 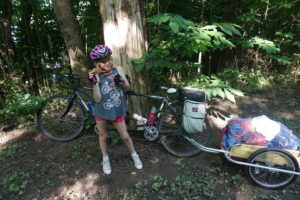 Even though it was 97 degrees, we had one last task – find the granite “Mile 0” marker – the official end of the C&O canal. We wove our bikes through rowers carrying their crew boats in and out of the water, and there it was, somewhat hidden behind a boathouse. During the last 20 miles of the ride, I was envisioning a big family hug at the end, high-fives for all and us reminiscing about our favorite parts of the trip. There would be none of that. We had finished the ride during maybe one of the hottest months on record and, after the obligatory group photo, everyone was now salivating like Pavlovian dogs, just wanting to head to one of Georgetown’s upscale (and air-conditioned) lunch spots in view–just over the shoulder of our volunteer photographer. After lunch, Susie and the kids went to my in-laws in Maryland while I rushed to board the 4 pm Amtrak from Union Station to pick up our car back in Pittsburgh. This daily train has a luggage car specifically equipped to transport bikes. There would still be a lot more non-bike related travel after picking up the family to get back to Boston; the next day I’d be on my way to Shanghai for business. During that 14 hour flight I had plenty of time to go through some pictures and reminisce about the adventure our family and friends had just experienced. While I was slightly relieved that no one was asking me “How much farther”, I faded off to sleep thinking about my daughter’s little hand drawing those letters on my back, a feeling I hope I will never forget.